Comprised of our various absorbent products which are combined to create a complete clean-up for daily or emergency use. Our spill kits come in different spill response capacity of 20 litres to 200 litres depending on your working environment and requirements. Crisben Spill Kits provides a complete solution in handling an Oil or Chemical Spills; from containment to total clean-up. The advent of this Hazmat Spill, the race against time is crucial. All employees must be able to respond. That is why in Crisben, we emphasize on Spill Response Training to all our Customers. A complete solution in handling Chemical; from containment to total clean-up. Approved for use in many Environmental Compliance and ISO 14001, DOSH and Environmental Policies compliance certification exercises. A complete solution in handling Oil; from containment to total clean-up. Approved for use in many Environmental Compliance and ISO 14001, DOSH and Environmental Policies compliance certification exercises. This Cytotoxic Spill Kit comes in a kit for easy storage and deployment at any part of your site. 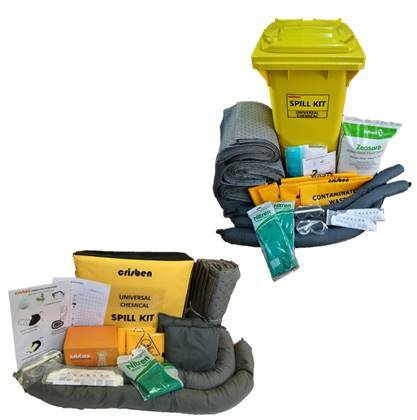 The kit contains a range of absorbents for Pathogenic Waste; vomit, blood, urine, biohazard and harmful liquids spills. The Mercury spill kit is for small Mercury spills due to broken thermometer, thermostat/ Sphygmomanometer and other equipment containing Mercury.